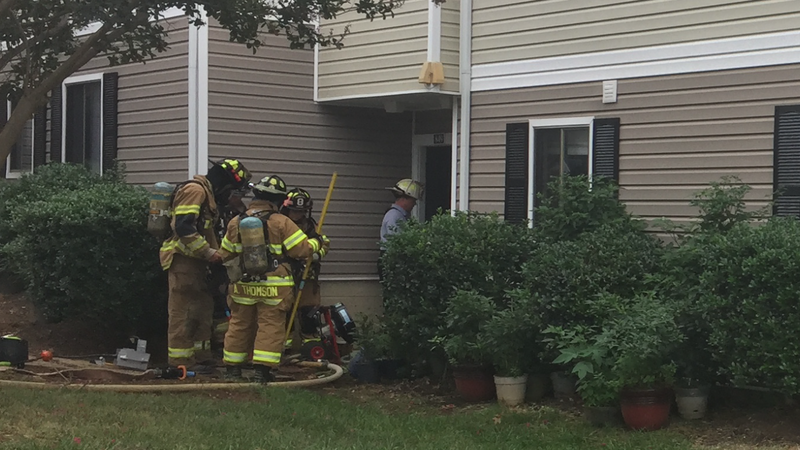 E81, TO121, E1, C89, CHF80, CHF83, and RS8 responded to reports of smoke in the structure at 849 Knight Ct at 13:45 Sunday afternoon. Units arrived on scene to find nothing showing from the apartment structure. Upon opening the unit door, firefighters found smoke in the apartment banked down to the floor, creating low visibility conditions. Firefighters rapidly deployed a hoseline and searched the compartment for fire. Crews discovered that burnt food on the stove was responsible for filling the entire apartment with smoke. Firefighters removed the burnt food and checked the unit to confirm no active fire was present. E81 remained on scene to ventilate the compartment and remove smoke from the structure. Firefighters prepare to check the apartment for fire extension.